Born in 540/1145 in Konye-Urgench, Najmuddin Kubra began his career as a scholar of hadith and kalam. His interest in Sufism began in Egypt where he became a murid of Ruzbihan Baqli, who was an initiate of the Uwaisi. After years of study, he abandoned his exploration of the religious sciences and devoted himself entirely to the Sufi way of life. Sufi sheikh Zia al-Din-‘Ammar Bitlisi was Kubra’s teacher, who tried to present Sufi thought in a new way to provide contemplation and influence for the reader.After receiving his khirka, Kubra gained a large following of gnostics and writers on Sufism. Because his followers were predominantly Sufi writers and gnostics, Kubra was given the title “manufacturer of saints” (in Persian: vali tarash) and his order was named the Kubrawiya. Kubra’s main body of works concerns the analysis of the visionary experience. He wrote numerous important works discussing the visionary experience, including a Sufi commentary on the Quran that he was unable to complete due to his death in 618/1221. Kubra died during the Mongol invasion and genocide after refusing to leave his city, where he fought in hand-to-hand combat against the Mongols. Overall, Kubra is remembered as a pioneer of the Sufi tradition and explanation of spiritual visionary experiences. Kubra’s work spread throughout the Middle East and Central Asia where it flourished for many years, until it gradually was taken over by other similar more popular ideologies and Sufi leaders. 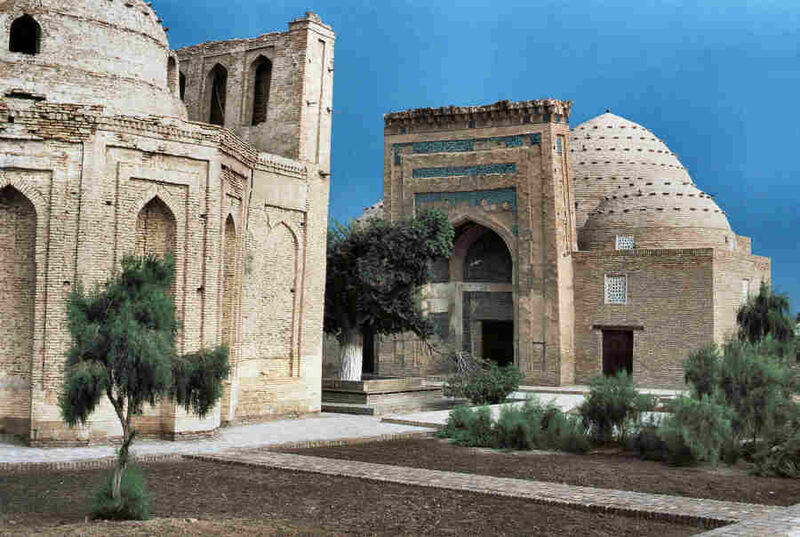 The Najm al-Din Kubra mausoleum is located in the centre of Kunya Urgench, just south of the Khan-yab canal. It is built in a pretty little walled courtyard with spreading trees located in the centre of a large open area just west of the Dash mosque and medresseh, which today houses a small local museum. The courtyard also contains the mausoleum of Sultan Ali. 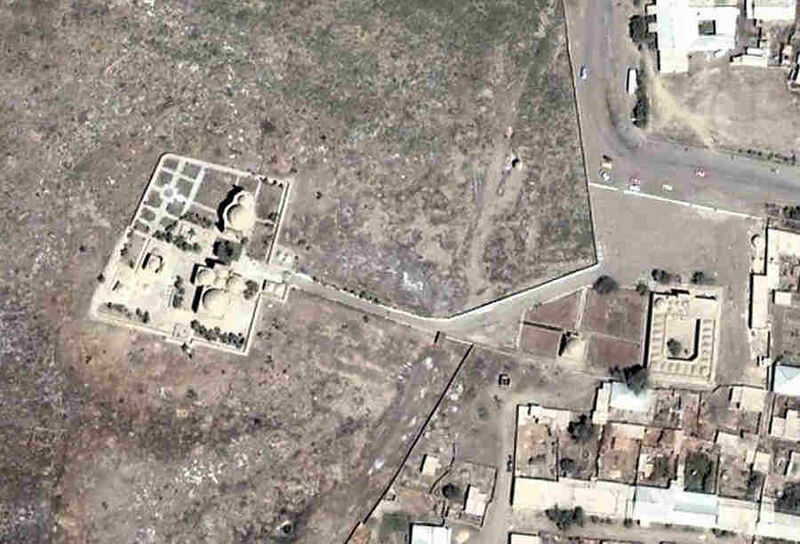 Satellite image of the Dash mosque and medresseh on the right and the walled courtyard on the left. The Najm al-Din Kubra mausoleum lies to the south of the smaller Sultan Ali mausoleum. Image courtesy of Google Earth. The mausoleum of Najm ad-Din Kubra is oriented north-south with its entrance on the northern side. The building is dominated by a 12 metre high portal or pishtaq, whose doors open into a small twin-domed entry vestibule, flanked on each side with square rooms. The latter have a single domed ceiling and their own separate entry doors on each side of the central portal. The entry vestibule leads into the main burial chamber, which has squinches in each of the four upper corners and is roofed with a large open octagonal drum. The walls are decorated with large arched niches. The whole interior is illuminated by small screened windows set in the walls as well as in the domes of the roof. The Najm al-Din mausoleum. Note the restored roof domes and two side rooms. The burial chamber contains the rectangular double sarcophagus of Najm al-Din Kubra in its north-western corner, next to a smaller rectangular shrine. Legend has it that Kubra was beheaded by the Mongols during the conquest of Gurganj and that one sarcophagus contains his body and the other his head. From the evidence of old photographs it seems that the sarcophagus was originally covered with blue glazed tiles and inscriptions. Today all that remains are the words El Mulku-lillah meaning “all things are God’s”. The Najm al-Din mausoleum, facing the Sultan Ali mausoleum. 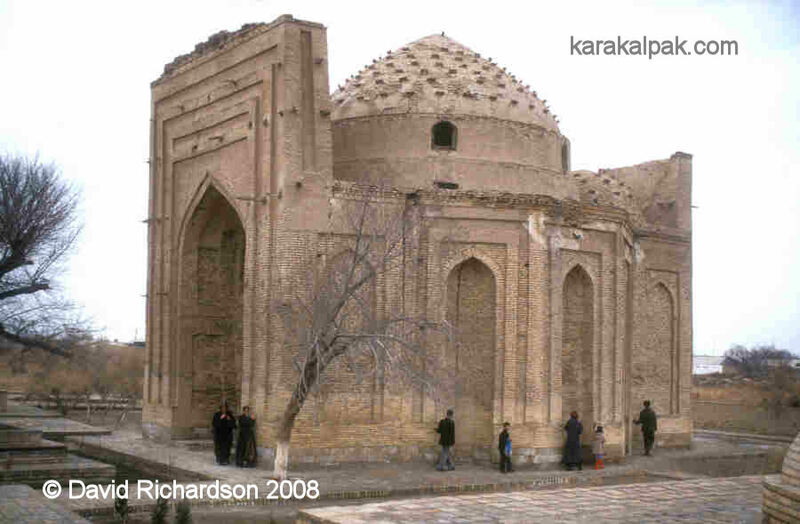 There are similarities to the mausoleum of the Nakshbandi Sufi khoja Sayid ‘Ala ad-Din at nearby Khiva. 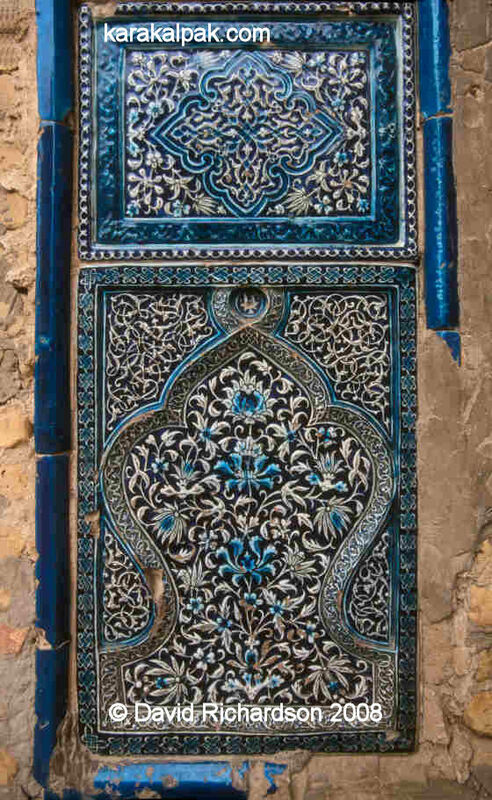 His tomb, which was built around 1340 and restored in the 1990s, is decorated with blue, green and turquoise majolica tiles. It is one of the oldest buildings in the Ichan qala. 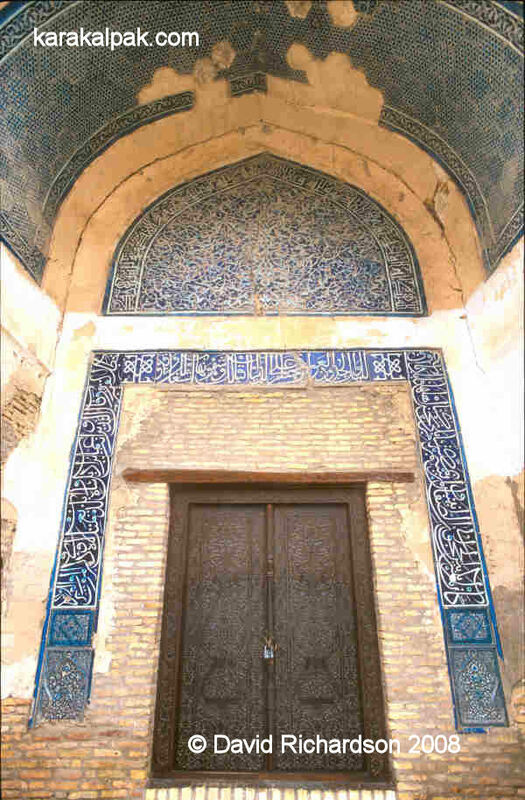 The tiled portal of the Najm al-Din Kubra mausoleum. The Najm ad-Din Kubra mausoleum was constructed from thin yellow fired bricks and the domed roofs are rounded on the outside. The portal is in a bad state of disrepair, with much of the brickwork covered in cracked cement render. Apparently the monument was partly restored in 1950 following the collapse of the central dome. Much of the original blue glazed tile work on the portal is missing. The two rows of tiles decorated with Kufic script along the top of the portal apparently praise Qutlugh Timur, the governor of Golden Horde Khorezm from 1321 to 1333, who patronized the building of the mausoleum. The facing of the portal around the arched entrance was once covered with simple hexagonal tiles, only the top rows of which remain. The best preserved tile work is over and around the replica wooden entrance door. The original doors are kept inside the mausoleum. 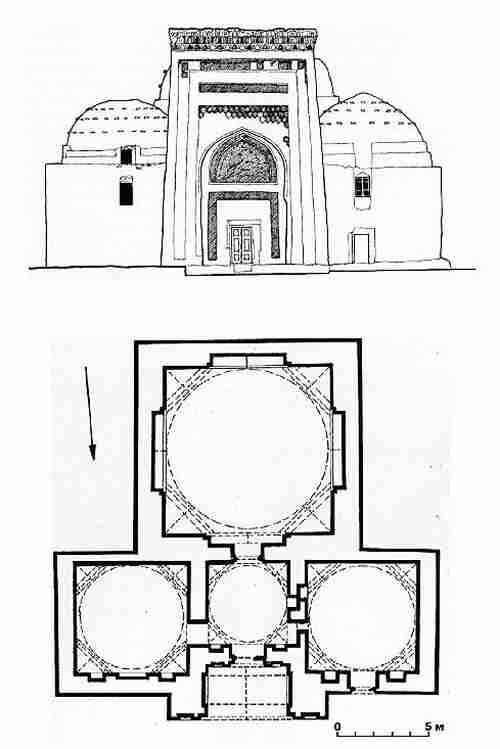 Drawing of the Najm al-Din mausoleum by I. I. Notkin, 1959. 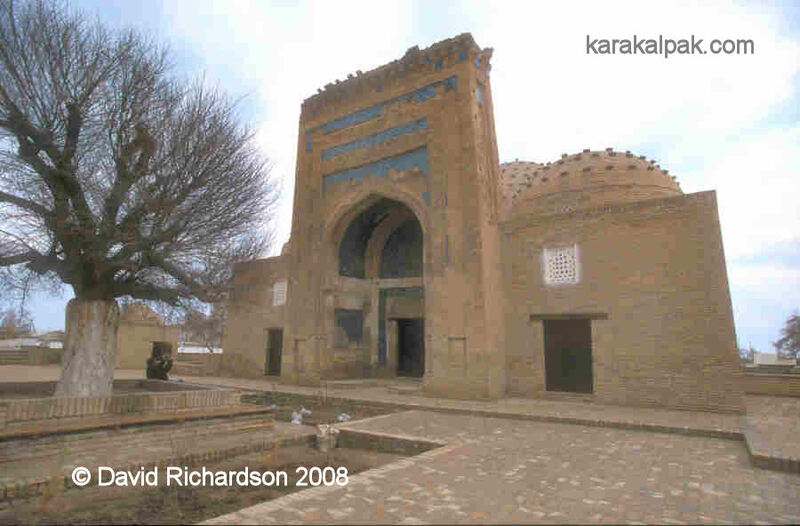 Najm al-din Kubra was born in Khiva in 1145, when the Qipchaq armies of Khorezm ruled over a large part of western Central Asia. After his basic education in Islam he moved to Dizful in western Persia to continue his religious studies. After the death of his second teacher he moved to Egypt to continue his education and to become a religious teacher. During his stay he married the daughter of his own religious instructor. He seems to have returned to Khorezm at some time between 1185 and 1190, establishing his own school of Sufi mysticism, which became known as the Kubra order. Decorative tilework around the main door. 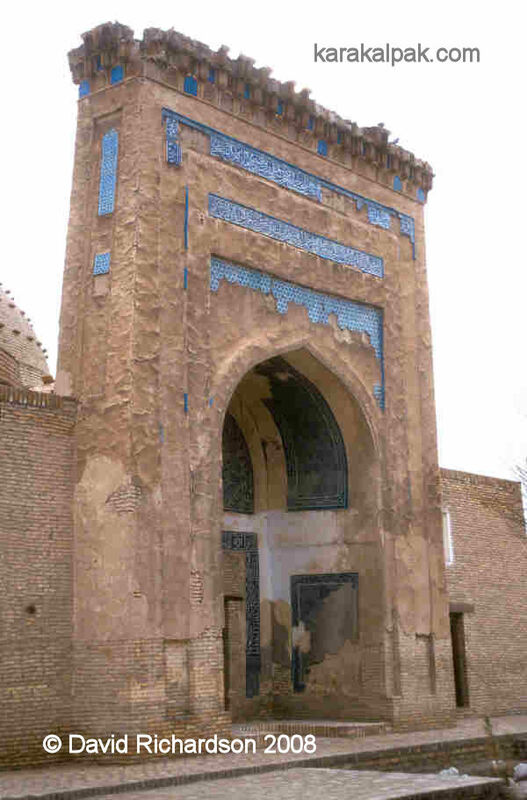 Najm ad-Din Kubra helped Khorezm become one of the major centres of Sufism during the 12th to the 14th centuries. Sufism is a mystical, spiritual and emotional branch of Islam, which aims for its adherents to reach God through personal meditation and secret recitation. The Sufi movement originally developed in Iraq and Syria in the early 9th century before spreading into western Central Asia. The movement’s name derives from suf, meaning wool, since the Sufis wore simple cloaks made from coarse wool. Najm ad-Din Kubra taught his pupils that they must become more Godly by personally undertaking a series of ascetic practices involving fasting, prayer and silent meditation under the supervision of a master. In time the pupil would progress from one spiritual stage to another, each symbolized by different colours; black corresponded to the lowest stage and green to the highest. Glazed tilework panel on the side of the entrance doorway. Najm al-Din Kubra wrote extensively and seven of his books and 24 of his poems survive to this day. His most important book was Fawatih al-Jamal wa fawatih al-jalal, or the “Aromas of Beauty and Preambles of Majesty”, where he recorded his own personal visionary experiences along with detailed guidance for students of his Sufi doctrine. In this book he described the details of the coloured lights and spots that appear when a novice undergoes spiritual training and how even the act of breathing expresses obedience to God, since the sound of exhalation and inhalation – “ha” – signifies Allah. His brand of Sufism, which became known as the Kubrawiyyah Order, was rapidly introduced to Persia, Afghanistan, India and China. At the time of Chinggis Khan’s invasion of Khorezm in 1221, Najm ad-Din Kubra was already 75 years old. Legend has it that the Mongols offered him the chance to surrender before the siege of Gurganj. He refused and fought alongside his fellow Khorezmians, only to be beheaded after its conquest. His mausoleum was constructed over one hundred years later under the orders of Qutlugh Timur (a name meaning “blessed iron”), who had been appointed governor of Khorezm by Sultan Uzbeg, the ruler of the Golden Horde. Qutlugh Timur happened to be the son of Uzbeg’s maternal aunt. It is not clear whether the mausoleum truly does contain the remains of Najm ad-Din Kubra. Nevertheless it still remains the most holy place in the Kunya Urgench region and attracts many local pilgrims. Just opposite the Najm ad-Din Kubra mausoleum is a later 16th century mausoleum built for Ali Khan, who was commonly called Sultan Ali. He was the son of the Khorezmian ruler Avanesh Khan (1535-38) and was appointed governor of Urgench (Kunya Urgench, not modern day Urgench) by the later Aqatay Khan (1548-1556). Aqatay Khan was one of Avanesh Khan’s younger brothers. Urgench was essentially in the middle of a civil war and Jenkinson observed that the town had been won and lost four times within the past seven years! The Sultan Ali mausoleum was built in the 1580s. It is a miniature copy of the Tura beg Khanum mausoleum, located on the edge of the ruins of Urgench just south of Kunya Urgench. However unlike the original, the copy has been built in simple yellow fired brick and has no decorative tile work whatsoever. This lack of decoration was probably a sign of the times. 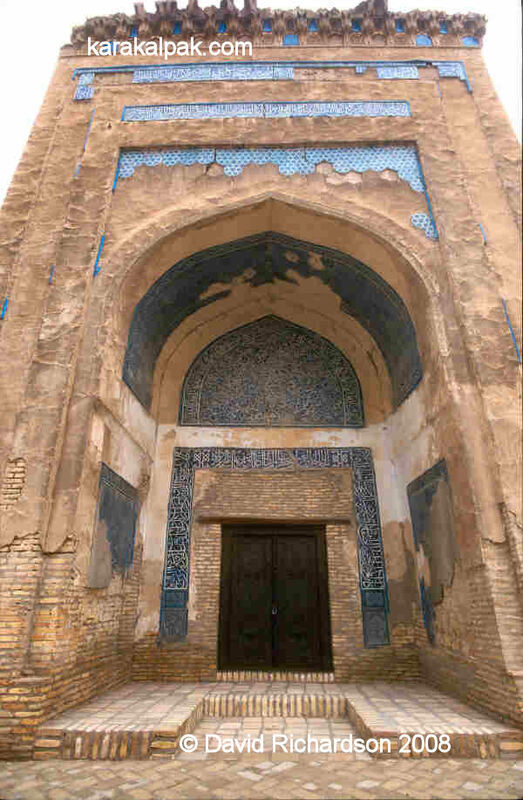 All of Khorezm’s master craftsmen had been long ago enslaved by Amir Timur and marched off to build the palaces, mosques and medressehs of Samarkand and Shahr-i Sabz. The Dash mosque and medresseh is just a minute’s walk away from the mausoleums of Najm ad-Din Kubra and Sultan Ali. It was built in 1908 and consists of a number of domed cells with doors overlooking a courtyard. Today it houses the local Kunya Urgench museum and is well worth a visit although there is a small admission charge. The museum contains various archaeological finds from the sites of Kunya Urgench, including some interesting examples of 12th century and Golden Horde tiles and ceramics and information on some of the monumental qalas in the surrounding region. 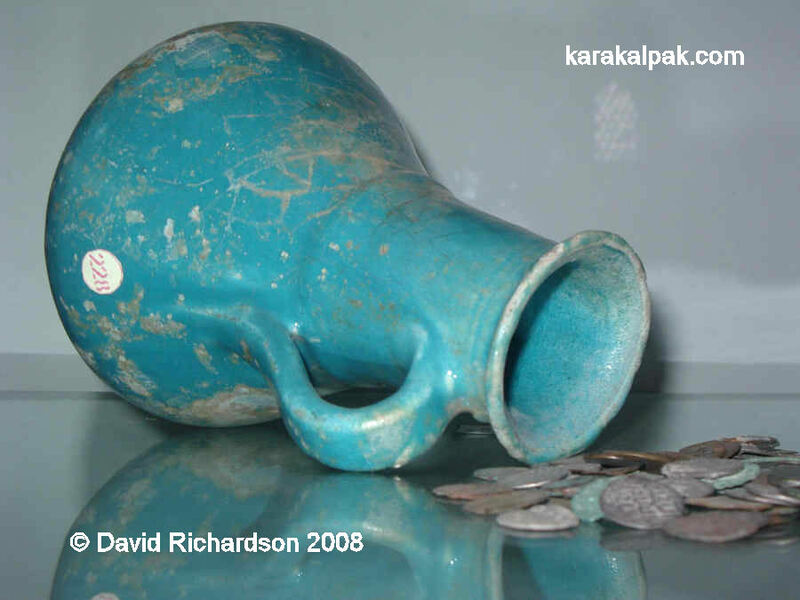 Look out for the blue polished vase excavated from the Sultan Tekesh mausoleum that contained a horde of 500 silver coins. The horde of silver coins.